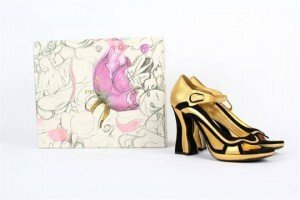 A fabulous pair of Prada gold leather and black suede cocktail sandals, with shaped high heels, slight platform, with original box. 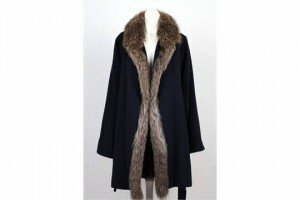 A vintage Yves St Laurent, Paris, dark blue cashmere and angora three quarter ladies jacket, with silver fox collar with long lapel fur on both sides of the front, soft tie belt. 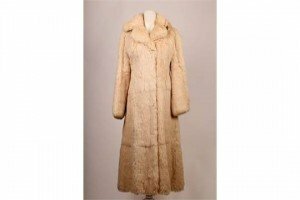 A 1960s full length white rabbit fur coat, with leather and gilt button detail, and a detachable hood, collar, long sleeves, side pockets, satin lined. 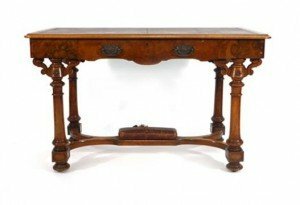 A Victorian figured walnut writing table with leather inset top and ogee shaped apron on moulded columnar supports joined by an X-stretcher. 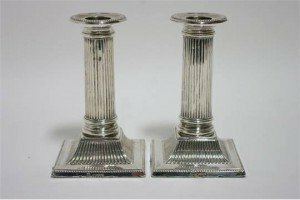 A pair of late Victorian desk candlesticks with round fluted columns, each on square base with fluted border & beaded rim. 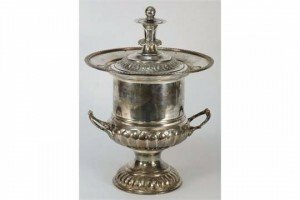 An Edwardian plated ice bucket of neo- classical urn shape:, with knopped cover, gadrooned borders and half reeded decoration on a domed circular foot. 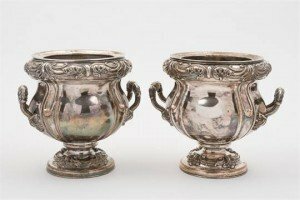 A pair of Edwardian silver plated wine coolers: of classical urn shaped outline, with scroll and foliate decorated borders and similar decorated loop carrying handles to the sides, raised on a circular domed foot. 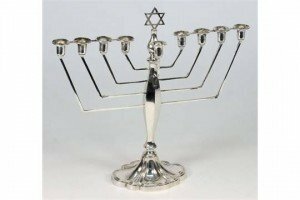 An Elizabeth II silver Menorah, maker AS, Birmingham, 1970: of traditional design with eight fixed branches and one detachable branch having urn shaped nozzles, on a swept oval spreading base. 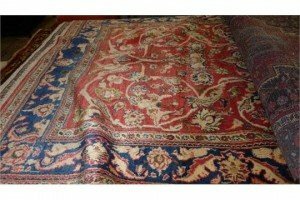 An extremely fine central Persian Isfahan rug central pendant medallion with repeating spangles on a rouge field guarded by multi stylised floral sapphire border. 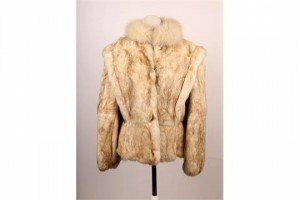 A 1960s Split Ends Ltd rabbit fur ladies jacket with white fox collar, V-shape design with big shoulders, narrow waist and peplum, full length sleeves. 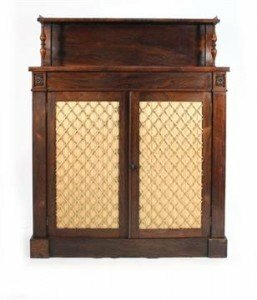 A Regency rosewood chiffoniere, the shelved superstructure with brass three quarter gallery, the base enclosed by a pair of doors with gilt metal grilles. 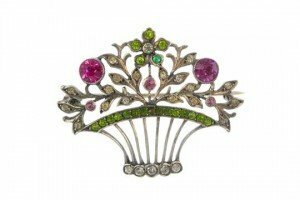 An early 20th century paste floral brooch, designed as a flower basket, set throughout with circular-shape pink, green and colourless paste. 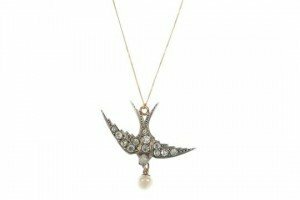 An early 20th century silver gilt paste swallow pendant, designed as a colourless paste swallow in flight, with red paste eyes, suspending an imitation pearl drop. 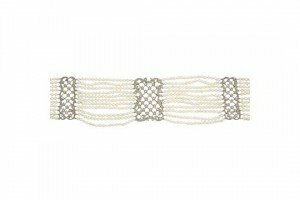 An early 20th century imitation pearl and paste silver gilt choker, designed as ten rows of uniform imitation pearls to the silver gilt, openwork lattice and scroll edged spacers set with circular-shape pastes to the slide clasp. 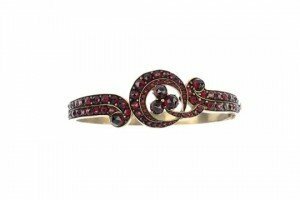 A late 19th century garnet and red paste bangle and bracelet, the hinged bangle with central crescent enclosing a trefoil-shape, together with a bracelet designed as graduated garnet and red paste cluster panels. 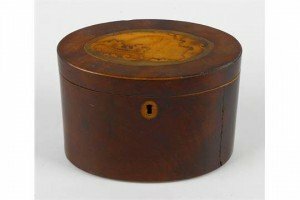 A George III inlaid mahogany oval tea caddy, the hinged cover with hare wood and stained lime wood husk patera, over oval escutcheon. 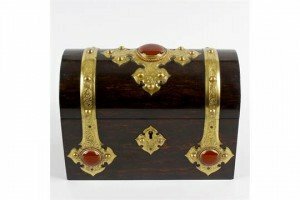 A George III inlaid satinwood tea caddy, of hinged canted oblong cover centred by a bat’s wing patera, within ebony and boxwood stringing and cross banding. 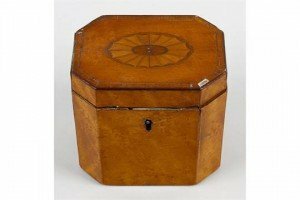 A 19th century mahogany tea caddy, of rectangular outline having shield escutcheon, the hinged cover opening to reveal central lined aperture flanked by hinged canisters. 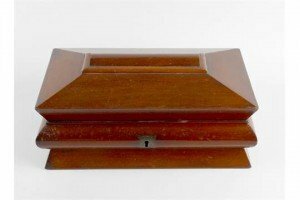 A coromandel box. 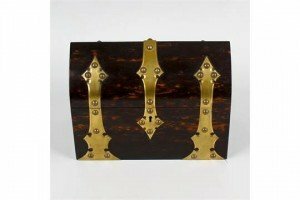 Having foliate engraved brass strap work and fittings set with large red cabochons within rope twist mounts to the exterior, the hinged arched cover opening to reveal a lined interior. A coromandel stationary box. Having plain brass strap work to the exterior, the lancet arched hinged cover opening to reveal a lined compartmented interior.